Laminitis: Is it a Death Sentence? Laminitis is a word that no horse owner ever likes to hear, but if you’ve owned a horse long enough, there is a decent chance that you, at some point, have dealt with a laminitic horse. First, let’s go over some very quick and basic hoof anatomy. The laminae are finger-like projections that interlock (think Velcro) to bond the coffin bone (the horseshoe shaped bone within the foot) to the hoof wall, supporting the coffin bone and thus the horses’ weight. 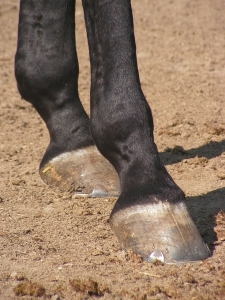 In laminitis, the blood flow to the laminae is reduced, and as with any “-itis,” there is inflammation and swelling, which in the closed confines of a hoof capsule, quickly turns into a painful condition. Consider if you have ever smashed your finger in the door, and the pain and pulse you can feel under your fingernail. Now imagine that you have to stand on that pain all day. That is the pain that a laminitic horse is dealing with. In severe cases, the laminae can be become so swollen that they begin to detach, and the “Velcro” begins to fail. 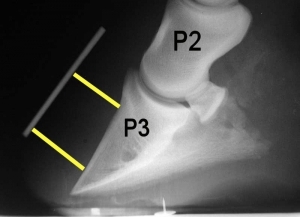 It is these cases that you may have heard people talking about “rotation,” or sinking.” These are descriptors of what the coffin bone is doing within the hoof capsule. Rotation is a detachment of the front laminae allowing the tip of the coffin bone the rotate toward the ground – in extreme cases even penetrating the sole of the foot. In further progressed cases where there is “sinking,” the entire attachment of the hoof to the coffin bone is compromised. The list of causes of laminitis is just about as long as list possible causes of colic, and include anything from too much feed (grass or grain typically), to a severe colic episode, to a metabolic issue. Here in Colorado, as we go into the fall season there isn’t currently much threat of grass issues, but metabolic episodes are always a possibility and contrary to the usual visualization of a horse getting into the grain stores, they are one of the most common causes. Conditions such as Equine Metabolic Syndrome or Cushings frequently go undiagnosed until a horse suddenly becomes lame and laminitic. 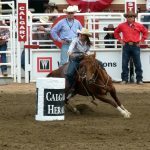 Will my horse be pain-free, or even rideable, again? Treatment of laminitis is focused immediately on decreasing the inflammation within the foot in order to reduce to risk of rotation or sinking. 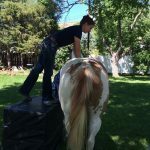 If rotation or sinking has already occurred, it is still possible to reverse the condition and eventually have a horse that isn’t lame, and even rideable. Unfortunately, it’s a gamble. Degree of rotation can be an indicator of the chances the horse will recover, but not always. Time and treatment are often the only way to find out if your horse will recover fully, and be forewarned, it does take a lot of time. In the long term, consideration must be given as to the cause to the episode. If the horse became laminitic due to an event (such as breaking into the grain bin), then once the inflammation is controlled (and a better lock put on the door), we shouldn’t have recurrence. However, if onset was due to a metabolic issue, then close consultation with your veterinarian should help to guide, and hopefully mitigate and minimize the chance for further laminitic episodes.